A photo of a popular mint candy has been going viral over the internet. 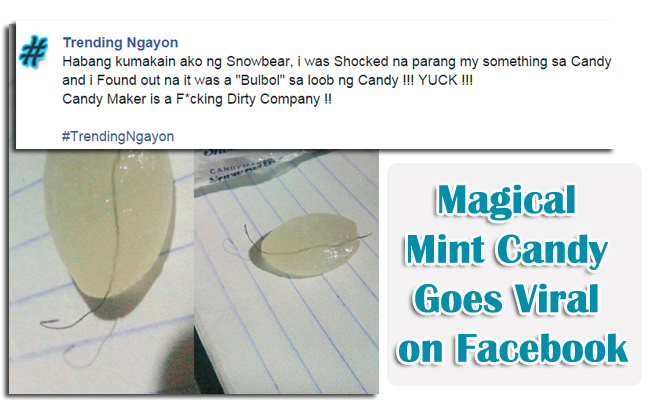 The photo posted in Facebook page ‘Trending Ngayon’, shows a Snowbear mint candy with a strand of hair stick in its crack. According to the one who posted it, he or she was shocked upon ealizing that something was stuck in the candy. Allegedly the hair a pubic hair right in the middle of the candy. The photo spread like wild fire and generated various reaction from the netizens. 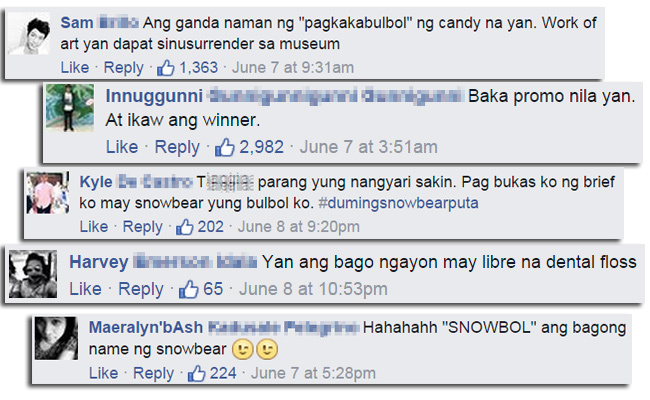 PauloPalaganas shared that it is natural for the hair to turn out as the candy itself is called ‘Snowbear’. Bears are mean to have hair while Facebook user Spinaltap Forge joked that it is like the Golden Ticket meant as a special pass to get in the Willy Wonka’s chocolate factory. Sam Brillo wittingly said that it was actually a work of art that must be surrendered to the museums, while Innuggunni Gunnigunnigunni Gunnigunni quipped that it may be a promo and the owner of the photo is the lucky winner. Brandon Chavez shared that the candy might be going through puberty while Armson Panesa commented that the owner of the hair might be the destined one for the candy’s owner. While many admitted that the comments were funny, others said that the photo itself is a fake. People can easily stuck a hair in the candy’s crack and the issue was not true. The photo has posted last June 7, 2015 and had been liked by more than 10 thousand Facebook users. It was shared more than 10,500 times in just three days.